The ACCUTOOL has a revolutionary, easy to hold design and features high performance cyanoacrylate. The new ACCUTOOL precisely applies the product where you want it, how you want it. You can get a continuous stream or drop-at-a-time application based on the amount of pressure you apply to the dispenser buttons. The Original Super Glue: Fast. Easy. Effective. This listing is for 12 individually packaged items. View More In Adhesives & Glue. 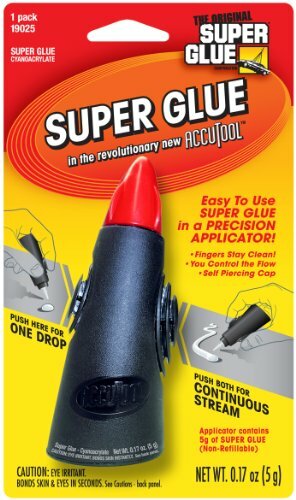 If you have any questions about this product by Super Glue, contact us by completing and submitting the form below. If you are looking for a specif part number, please include it with your message.